Monitoring of Engineered and Natural Systems Using Sensors (MENSUS) is a new interdisciplinary initiative centred at the University of Southampton that focuses on system monitoring technology and applications, and exploits expertise to tackle the challenges encountered by many industrial sectors. The Industry Showcase was designed to give an overview of research being conducted across the UK and in particular at the University of Southampton, providing valuable insight on the latest ideas and technologies, and potential areas of new funding. This provided us with a great opportunity for networking and new collaboration discussions with a wide range of industry, government and academia representations in attendance. 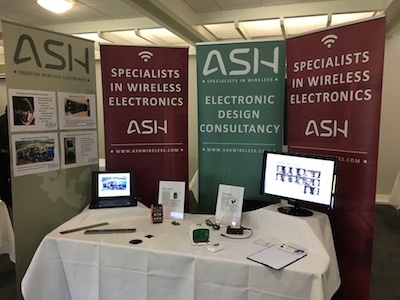 The ASH team had a number of case studies on show including our recent In-shaft Digital Heat Transfer Array measurement system. This system, developed for Oxford University, was designed to accurately determine, record and stream, the heat transfer profile of a turbine blade while at 10,000 rpm. Thermally and mechanically created to meet the challenge of operating in a vacuum and at the 3,500 G force present within a rotating jet engine shaft . It was designed to accurately measure small, fast thermal changes to model heat transfer as air hits the turbine blade and captures thirty-two channels at four mega-samples per second. The team very much enjoyed the event and look forward to partnering with the group further. Kepp ypu eye on the MENSUS webste for more details.